Ganesha focuses in this article on an actress who shot to fame with her first film Parineeta and is earning rave reviews for her breathtaking performance in her latest film Bhul Bhulaiyaan. Yes, we are talking about none other than the gorgeous Vidya Balan. She had started her career as a television actress and bagged the role of the dutiful Parineeta. Since then, there has been no looking back for her. Ganesha is interested to know what destiny has in store for this talented actress. Vidya is an actress who is working really hard to get where she is, with a firm amount of dedication. She was born on 1 January 1982, in Palakkad, Kerala. She is an Indian actress based in Mumbai. After acting in a couple of films, Vidya Balan has come in the top list of Bollywood Film industry. 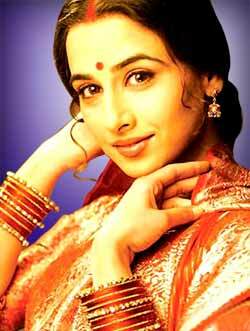 Anyway, Vidya Balan came to the film industry with a Bengali film named `Bhalo Theko' and her first Hindi film was Vidhu Vinod Chopra's `Parineeta'. By acting in this film, she achieved two prestigious awards, Film fare Best Female Debut Award & Fair one Film fare Face of the Year, and was listed as the Film fare Best Actress Award. She has just celebrated her birthday on 1st January. In 2008; Jupiter will be passing over the Natal Sun in her chart, which would be good for her financial condition. Her prosperity will increase. She may get good film offers during 2008. Her Sun sign is Capricorn. Saturn rules Capricorn. Thus, she will climb to the top in film industry slowly but it will be strong. She will get fame, prestige and money in her field. She has a charming personality and will be enjoying all the comforts of life like health and wealth. May Lord Ganesha bless Vidya with more achievements!